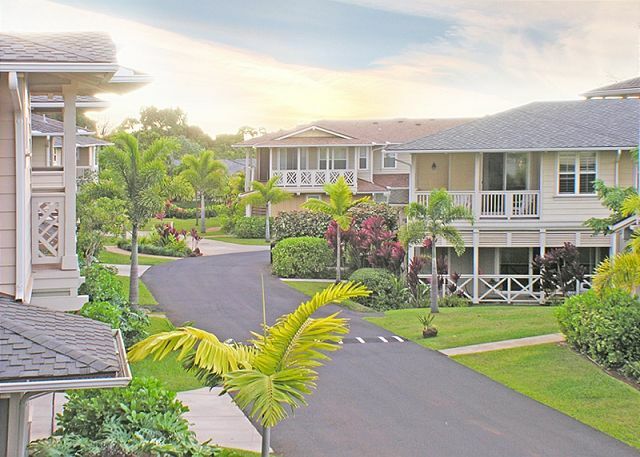 Townhome in Princeville, Nihilani Complex. 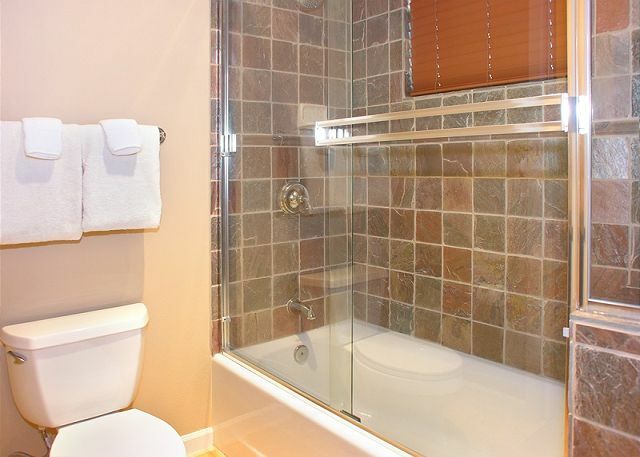 Built in August, 2006, this 1874 square foot luxury unit is elegantly furnished, with three full bedrooms and 2.5 baths, including Jacuzzi bath in master bedroom. The well-supplied gourmet kitchen, featuring granite countertops and central island, is perfect for multiple cooks to prepare outstanding meals with fresh island ingredients. Air conditioning and ceiling fans throughout. Plantation style shutters give a traditional feel. Attached two-car garage provides direct access to house. Hawaiian garden setting at pool facility on premises. 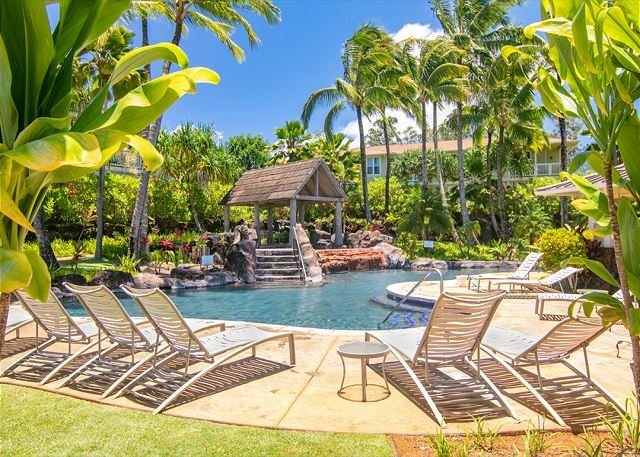 As a guest at Nihilani 22C & RE/MAX Kauai, you'll have access to Kauai's Premier Concierge Service at (855) 665-2824 http://kauaiva.com/index.html, we will help you build your perfect vacation. Rooms Sleeps 7, 3 full bedrooms (King, Queen, 2 Twins, Full size Futon) all upstairs and 2.5 baths. We stayed for a week in this awesome condo, the space was amazing, clean and SPACIOUS! It was a little bit of a walk to the BBQ area and the pool, but with all the unit had to offer it was a worthwhile trade off! Great view of the golf course from the master bedroom. All in all it was an excellent week for our family of 5! The pictures don't do this place justice - it is AMAZING. So beautiful and this house absolutely perfect for our family! Plenty of space - the master bedroom and bathroom were spectacular. Pool space was beautiful. We will definitely rent again when we come back. Luxury and a lot of room. Loved the kitchen and the dining room table. Beautiful surroundings. The condo was beautiful and in a great location. It is spacious and had everything we needed. The carpet downstairs was a little dirty - but the rest of the house is perfect!! We had an incredible stay!! Our family of 4 stayed 4 nights in this unit and we loved it! 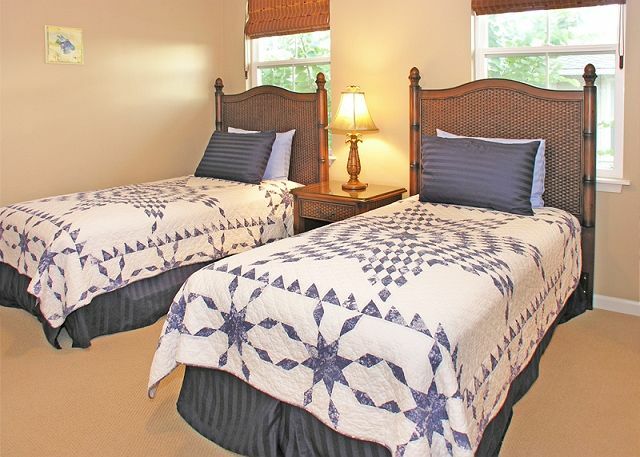 Our two kids got their own rooms, which is great and we really like the master bedroom, plenty of room for everyone. 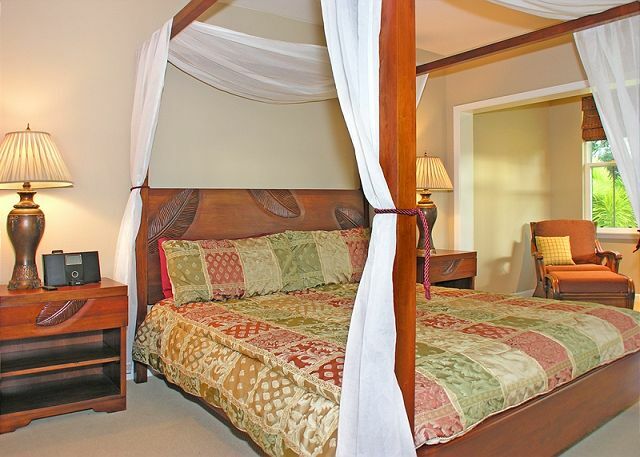 The house is well equipped with just about everything you need for your stay. 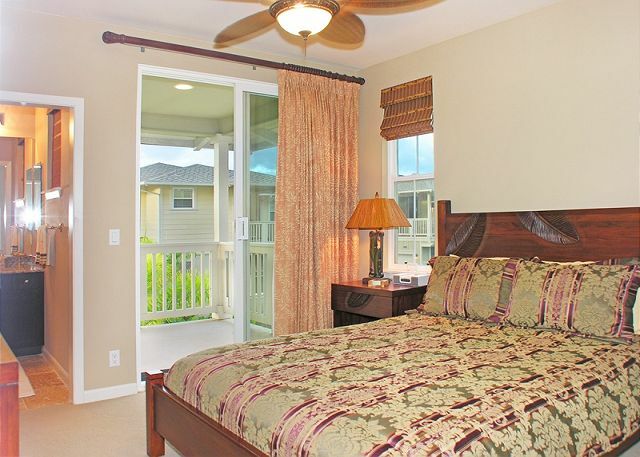 Its located in a central location, 10 minutes to Hanalei and about 2 minutes to the local food store. AC worked great and kept us nice and cool. 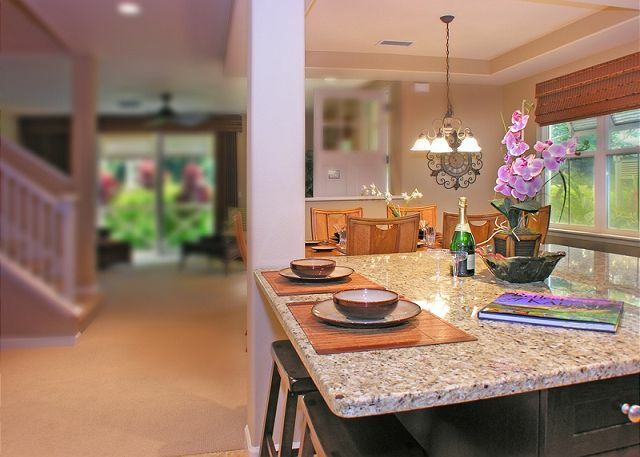 Kitchen is stocked with everything you need and the BBQs are about a 2 minute walk to the pool area. The unit was very clean too. It was nice to have a garage to pull into everyday. Only have a couple of complaints/issues. There are 4 bikes in the garage, 3 are adult size and one children's bike. 2 of the 3 adult bikes were not functional. The rear gear mechanism was hanging off both of them and I called to report, but they were never fixed so we could not use them. The clothes dryer didn't work and we had to wait a day for the repair guy, worked before we left. The coffee maker carafe was so coffee stained it made my coffee bitter and undrinkable. Easy fix, just buy a new one for $50. All said, it's a great unit and we only had 4 people there, but can easily accommodate more! Definitely recommend it! 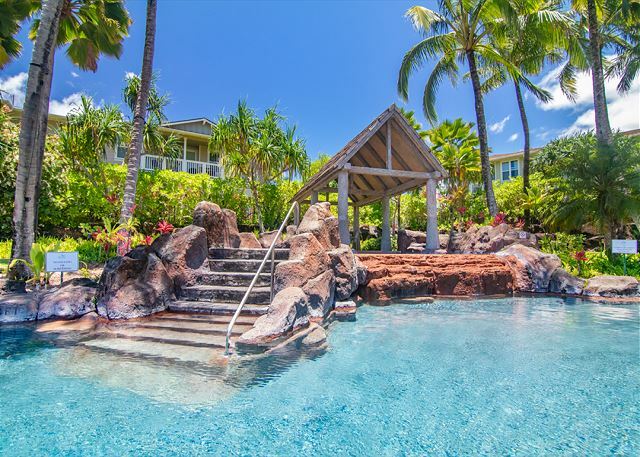 We had a wonderful stay at Nihilani 22C condo in Princeville. The place was perfect for our weeklong vacation with my sister's family of 4 and our family of 3. The condo was roomy and spacious for our 2 families. The kitchen was well stocked with everything we needed to cook family meals together and the additional refrigerator in the garage came in very useful after our Costco trip. The garage had great gear for the beach and pool. We appreciated not needing to bring a lot of towels and beach gear, especially traveling with a couple of toddlers. Having a/c and being able to do laundry were big plusses as well! The pool was nice and we really appreciated the upper pool that was well-suited for toddlers. Overall, we wouldn't change a thing - it was a relaxing and fun vacation for everyone and we look forward to returning soon! Great first floor, disappointing second floor. On the positive, the 1800+ sf was more than adequate for 2 couples and 2 single guests. On the ground floor, high end built in kitchen appliances including 2 Fisher & Paykel dishwasher drawers and a 24 bottle (approx) wine fridge. Large kitchen island convenient and made food prep easy. Extra full size garage fridge really useful as we were hosting our wedding and we used all of the refrigerators for chilling wine, water, and beverages besides home use the day before and of the wedding. Plenty of dishes, glassware, kitchen tools, and pots and pans were appreciated. On the down side, the second floor needed some investment. The master bed mattress and cheap pillows really need to be replaced. 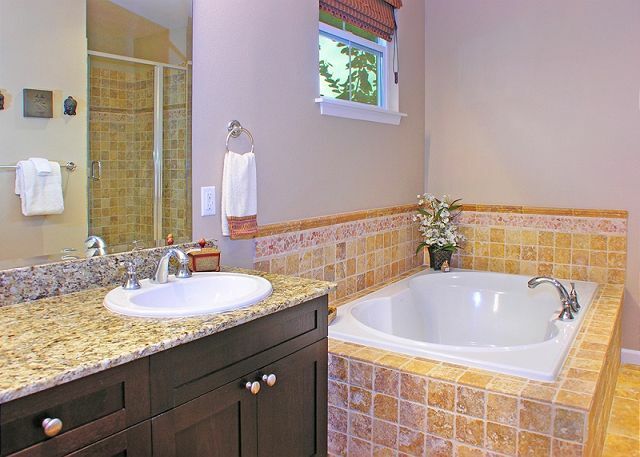 The shower head in the master bath was essentially nonfunctional, as only a thin stream of water came out. Because we had other guests using the other bath/shower, we ended up having to replace the master shower head. The one that was there was corroded and had never been cleaned. The washer and dryer (second floor) were high end but a bit complicated to use with no instructions posted for using the sensor to determine water level. Poor lighting also in the master bedroom, which was the only bedroom without a ceiling fan (and needed one with one-zone a/c for the whole unit). So for a relatively small investment in bedding, a ceiling fan and better lighting, this place could easily rate 5 stars. We were delighted to find bikes for our use in the garage but only one was functional. A simple and relatively inexpensive fix would help. My husband and I have been to this beautiful island and got to share it with our 3 teenage daughters and my mother and step father. This was the nicest place we have ever stayed! Bikes and beach gear in the garage, extra fridge for drinks in the garage, the most comfortable mattresses ever and so roomy! With 7 people it can get crowded but I worried over nothing, there was plenty of room. The kitchen was great and had all the appliances. We loved sitting on the upper deck and looking at the golf course. BEAUTIFUL!!! Thank you so much :) We will be back!!! Amazing as always. Perfect location but the complex has A LOT of rules. This place is incredible. Spacious house with a stelar kitchen. The master bedroom is awesome. Plenty of room for a large family or a bunch of friends! Shopping center around the corner, and Hanalei Bay the Napali coast down the highway. Also secret beach and turtle cave is nearby. Beautiful place. It had everything we needed. Would definitely recommend it to anyone. The condo is spacious, luxurious, and clean. It is in like new condition inside. The owner of the condo is extremely nice. Angela from Remax was excellent to work with. Be aware that this condo, like 99% of condos in the Princeville area, is not on the beach. The closest beach is Hanalei Bay, which is a short drive from the condo. Overall this was a very positive experience. We would definitely like to stay here again. WOW! This condo was absolutely gorgeous and inclusive of everything. The only thing that I would have loved more was being on the water. But the view of the golf course was beautiful so I didn't mind at all. You would never know that the condo is connected to 2 others. I am bummed I forgot to write in the guest book before we left. Oh well, next time! Maybe we will be back for our 10th anniversary in 2019! Very clean, spacious, and stocked. We enjoyed this condo very much. It was very clean and spacious. The garage had boogie boards and bikes and a spare fridge which came in handy. It was so nice to deal with Remax. Checking in and out was zero hassle. We will definitely be staying here again. We loved it here. Some road noise heard in master but shut the patio doors and turn on a/c if needed. The futon is not comfortable but we found an air mattress that was able to be used. For the value you cannot beat this unit. Remax was great as well as we needed a bike repaired during the stay. Great house in a great location. 5 minutes to our favorite beach on the island, Hanalei Bay. The place is stocked with everything you need: towels, beach gear, bikes... 5/5 would rent again. We have stayed at many homes over the years. This one is by far the best we have ever been to. I highly recommend it. It is beautifully maintained and the architecture is unsurpassed. The property manager made our stay so easy and they were so delightful and friendly. 5 Stars! Great condo! Our huge group stayed comfortably. Only negative was the cleaning lady stopping by to remind us to be out at 10am so she could get started soon. We had a wonderful time staying in Kauai! The condo was comfortable with all of the amenities we needed! 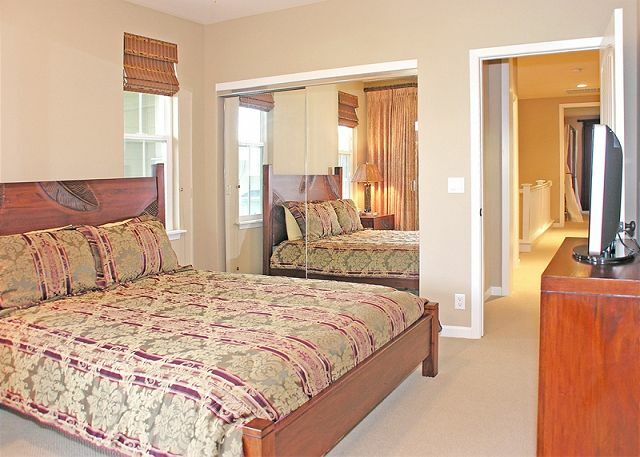 We've stare in other condos in the same complex, but they beds in this condo are amazing. We will be back in a couple of years and will try to rent the same condo! 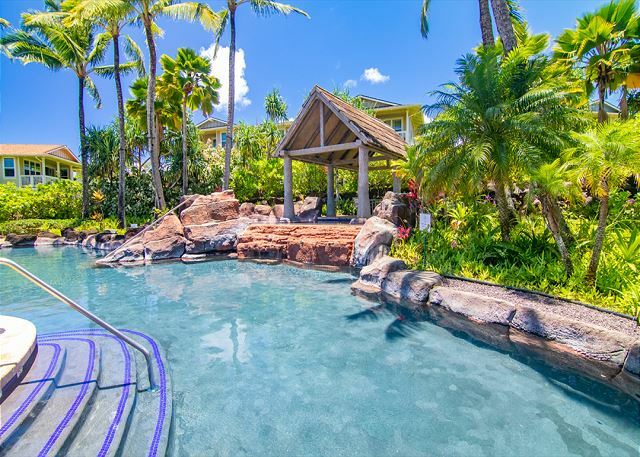 Princeville is the ideal location for going on vacation on Kauai.We have been coming here for the last seven years and the Nihilani is the best.All you need is change of clothes and your food.Everything is there. We had an outstanding vacation and loved our rental ! 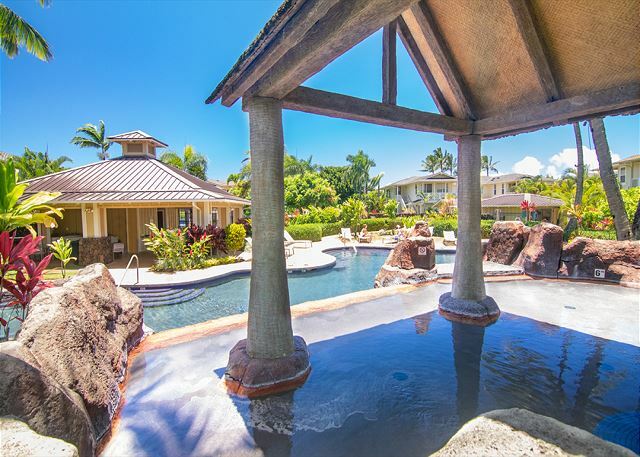 The rental is located in Princeville and is walking distance to the beach, shopping center, and a 10 drive from Hanalei Bay. The 2 story rental is very clean, is spacious, and perfect for a family of 5. The unit has AC which is a plus and access to a pool. The pool is a 1-2 minute walk, perfect for kids ! This unit had many amenities, such as a cooler, snorkel gear, boogie board and 4 bikes. Overall we love staying in the north part of the island and would recommend this rental to any family looking to stay in a clean, modern, and spacious unit. Townhouse was in great shape. Clean and comfortable. A major problem for us was the 24/7 noise from the main road in Princeville. We could leave the doors or windows open to enjoy the breeze and needed to keep the A/C on. If people only like A/C then this is the place for them. We loved our stay at Nihilani 22C. We spent 8 nights, including Christmas Day, and couldn't have been more happy with the accommodations, the location of the unit, and all the amenities provided inside the condo. Just about anything you'd need was provided, from beach gear, to bikes, to coolers, to kitchen and laundry supplies. The property description on VRBO and the ReMax sites were accurate. The house was beautifully decorated, and very spacious and comfortable for my family of 5. It was very clean upon arrival, and the entire process from initial contact with the owner, to everything with ReMax went seamlessly well. I hope to stay in this same unit again when we return to Kauai. We spent most of our time with my brother's family, who owns a unit in Nihilani, and spent a lot of time at Hanalei Bay, snorkeling on the St. Regis Beach just down the road, running the path of Makai Golf Club down to the St. Regis, spent a day at Princeville Ranch Adventures zipping and kayaking, went to Tunnels Beach, Glass Beach, Poipu Bay walking trail, Kauai Coffee and the Smith Family Luau in Wailua. Also checked out the Christmas village in Lihue on Christmas Eve to see Santa. Just a great trip, and the accommodations made it even better. Rental was easy! The only issue we had was that the TV in the main living area did not work, called to get corrected and the agent sent out a technician, but the cable company was needed. Did not appreciate the attempt to have Dryer service done on our stay. Condo was as expected, clean, central to whatever we required. The Home was very nice, beautiful, well stocked, and lots of room for multiple families. Only down fall is it is very hard to get 2 larger vehicles (jeep and van) in the garage due to a tight fit and the angle you have to turn to get car into garage. Daniel B does not recommend this vacation rental. WOW!!! very impressed with the quality of this lovely home.Thanks for sharing your home with us.This condo was very clean and well equipped, including beach towels and nice linens. The appliances, including washing machine and dryer, were all relatively new and worked great. They had many wonderful extras that we did not need, ie. baby crib, high chair, coolers, etc. You did not feel like you were in a rental; rather that you were staying in a friend's home. Since this place was so nice, I am cautious about mentioning some cons, but maybe this will help management--here are a few items that need improvement:All the beds were uncomfortable--need new mattresses, the futon that makes into a bed was very uncomfortable for sleeping, and no boogie boards. The condo was nice, but I didn't like the additional charges ($250 for cleaning and $50 non refundable security deposit. Also we like Hanelei Bay area, but the 45 minute drive to Kapaa got tiresome. Also, we didn't have hot water in the kitchen sink and there was a small leak under the sink. We called maintenance, and they put a new garbage disposal in, but didn't fix the hot water issue. Great place that feels like home away from home. Great location on the north side and really clean. We would recommend this property to others. Enjoy all the local sites and the rest of the island as everything is close. A bit noisy on the main road side bedroom and the king bed needs replacing. A few other minor maintenance issues. A few too many rules to follow and pool closes early. The home does not sleep 8 as suggested. Only proper beds for 6 and 1 more for a small child but not comfortable for a week or more. Comfortable for 4 adults (2 couples) and 2 children. As this was our first family vacation, we had the best time ever! The house was awesome and so was the community. Everything was at our finger tips. This location is perfect for some good down time and recharge the batteries in you. I HIGHLY recommend this beautiful home to anyone who is thinking of heading to the Islands. My family enjoyed our stay in this very comfortable property. It was clean and well maintained. The house was well equipped with necessities to make it feel like home. The community was lovely with beautiful mountain views and a great pool. We had a great time. The property was beautiful and very comfortable. We were very pleased and would stay there again. We were very pleased to stay at the Nihilani. It was everything as advertised. Clean, updated furnishings, spacious. Rooms were upstairs with good sleeping arrangements and nice baths attached. The Lanai's were good for morning coffee, reading and to plan your days fun. Bikes came in handy for fun rides to local shopping center, The St. Regis, Queens Bath or Hideaways Beach as that was the only near by things to do besides golfing on the 2 courses that surround the area. You will need a car to see other main points on the island. Which is perfectly fine because you will want to see it all when you get here it's that beautiful. Everything is within a 20 min to just over 1 hour drive away. It was nice to come back to this home after a long days fun to relax, unwind, clean up and have dinner a movie a game or whatever you would normally do at home with your family. It had everything a home should have. Great experience in Princeville from beginning to end. Everything about the property was as good or even better than expected. It was really flawless from the management point of view and everything possible was done to make sure that our stay was perfect. The property is clean, updated, comfortable and in a lovely location. The only downside is that the road that this unit faces is on a street which is surprisingly busy and noisy. We wondered where all of the people were driving to at 3 or 4 in the morning, but it didn't detract from our vacation in any way. I would definitely stay there again. Very nice location. Very spacious. Great view og golf course and mountains. Nice and quiet. Great place to stay. A really great place to stay! Very Spacious. Our stay at Nihilani 22c was AWESOME! The condo is a great price! Nihilani 22c is in great shape, clean, and large enough you can spread out (there were 6 of us), and has everything you need. My small children enjoyed the sand toys immensely. The pool was very nice – but not heated (we went in January) so it was cold. There isn’t a view of the ocean but there is a view of the golf course and mountains. Which was beautiful. We recommend Nihilani 22c to anyone needing a great place to stay! We all enjoyed to stay in this beautiful house in awesome location on Kauai . House has everything that you may need , from stuff to bake cupcakes to soft boards , beach chairs and toys for children . During our stay we had planty of time to check the whole island and can say that Princeville has the best views , beaches and it is the best place to be on the island. If you have a car it's 5-7 minutes ride to the mist beautiful Hanalei beach or also amazing Anini beach. I highly recommend this property and want to be back here the next year !! Everything explained to me very clear. Reservation set up in advance. Very thorough and very organized. Thank you for the excellent experience. Nihilani 22C was amazing. The Master Planned community within the Princeville area is gorgeous... Lush greenery everywhere. The ocean was a short walk/drive away as well as all the modern conveniences of coffee shops, restaurants, and grocery stores. The owners thought of everything in this rental. By the end of our first day, it felt like our home away from home. GO!!!! You wont regret it. Spent a week here with my one-year-old. The kitchen was new and fully equipped. Spacious place with bikes and boogie boards - more amenities than any place I've stayed in the past. We enjoyed our vacation in Princeville very much. Partly because of the nicely-appointed accommodation. Re/Max promptly attended to any concern that we had and we found that both the condo and the grounds were very well maintained. Traffic noise was a little distracting until we became accustomed to it. Condo is well designed, furnished and maintained. Remax was very attentive and quick to respond to anything we need after our arrival. Large garage was a plus for us. Pool is great, located in beautiful tropical garden. Residents from the area we have met were nice and friendly . 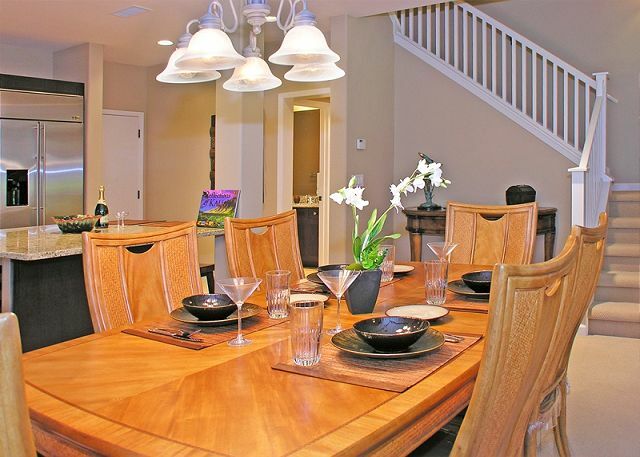 Beautiful townhome with all of the comforts of home. We were 4 audults and 2 children and there was plenty of room for everyone. Everything that we needed was there and the property was well kept. Great pool, bbq area and neighbours! We would definatly stay here again. Overall a great place. Very well furnished, large unit, everything in great condition. Amazing value (Our total was a mere thirteen hundred for five nights). Lots of great beaches nearby (I recommend Hideaways, if you can handle the steep treacherous stairs). Touristy area in nearby Hanalei. Amazing huge kitchen. Nice appliances. Wine chiller. Lockbox was broken, had to call them to let us in. Pool/hottub/bbq area closes at 9pm SHARP. 2 car garage is tough to park two cars in, but do-able. The outdoor visitor parking lot often fills up. The "Office" with the couch bed has no door on it (only a problem if you have more than 5 or 6 people). Local resident walks dog without leash and yells at you if you drive over 5mph. Long drive to Waimea Canyon (2+ hours). Ice maker in freezer jammed up. This was our fifth trip to Kauai and our third stay at Nihilani. Our family agrees that Kauai is our favorite island and Nihilani is the best place to stay. We feel at home here. The staff is outstanding. They have always been quick to respond to any of our needs, as well as to provide directions to the best beaches, restaurants, and scenic spots. We plan to return every year to this same spot. Our thanks to Cyrila and her staff. You are the best! Our family of 5 had an amazing experience Nihilani 22c. The house was spacious, probably even enough room for another family. Everything was clean and well maintained. Plenty of house towels, a washer and dryer, everything we needed! It was also very central to everywhere we wanted to go. I would definitely stay there again and recommend it to anyone. This home is perfect for a family. Plenty of space around the house, amazing kitchen and fun supplies for a perfect day at the beach. Would recommend this home to anyone! m y husband and i had the pleasure of spending two wonderful months on this beautiful was the perfect holiday.Nihilani 22c was very clean,and much larger then we expected.every thing was provided,it was a joy to cook because everything was new and top of the line.we are both so thankful for the time we were able to spend there.for us it was a little taste of heaven. again thank you. of them all. The house was extremely spacious for our family of 4 and the office loft with printer was a real plus. We loved being situated in Princeville, with access to golf and tennis across the street, the st. Regis a mile away, and Foodland down the road. the first night but we did not notice it after that. and really liked that there were plenty of things to do while there. We will definitely consider staying here again on our next trip to Kauai. I live on Oahu. My cowoker and his family from NJ came with me to Kauai and they really enjoyed both the location of the condo, the child friendly condo (they have a two year old) and the island. They've been staying in Waikiki for the month and fell in love with Kauai. This condo is very idea for both family and a group of friends. I definitely plan to stay there again for a longer period of time. By the way, I LOVE THE KITCHEN. Made me want to cook even while on vacation! Our family -- my wife, two sons, daughter-in-law, two grandchildren and I -- stayed 11 days and had an amazing time! Perfect location, glorious scenery, short walk to beautiful pool. We ate in a lot -- the kitchen was user-friendly and had all the conveniences of home, if not more. It was very difficult to leave! Plan on coming back to this unit. This house is well maintained and very clean. 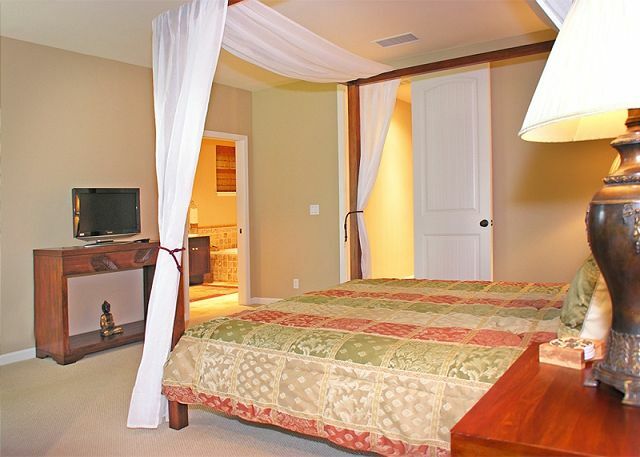 It is located within minutes from some of Kauai's most beautiful locations. We highly recommend this house. It was perfect. nicely appointed with good quaility things. would have paid extra for a view! overall a great value. Margie B from Nipomo, CA does not recommend this vacation rental. 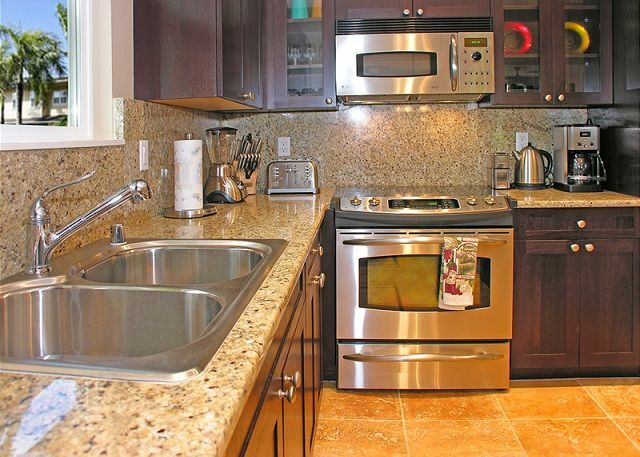 This condo unit was beautiful, well-kept, with all the amenities that we would need. There were 8 of us (6 adults/ 2kids).... and we were all very pleased with the accommodations. The location is wonderful... close to many of the north shore beaches ie. Anini, Tunnels, and Hanelei. It is quite a drive to get to the other side of the island... but, for snorkeling, I think the north shore can't be beat. Townhouse was in great shape. We loved all the up to date kitchen appliances! We were disappointed that pool was closed for the last 2 days of our vacation. The place was very nice and very well kept. I thought everything was simple great. We thoroughly enjoyed our stay. The property was beautiful and the vacation home was immaculate and had everything we could want. It was an incredible deal. The unit is beautiful. The pool and grill are a short walk away.